Finally, FINALLY, I got to try the food at Momofuku Ssam Bar today. Ever since it opened, I’ve wanted to sink my teeth into all the pork and offal goodies, but with school, work, etc, there just wasn’t enough time for me to trek to the East Village. But the past is behind me now, and the future ahead looks very bright and Momofuku-filled. I brought along a friend; for anonymity’s sake and because he absolutely insisted on the nickname, let’s call him Trix. Trix isn’t a schemer or skateboarding champ but rather, the guy who always falls for the ill-conceived prank or reveals confuzzlement when plums are marinated in interesting herbs (ginger?! what!?) He is, however, a good eating companion, and being of Korean descent, I thought he’d appreciate the special twist on Asian food that David Chang’s restaurant applies. 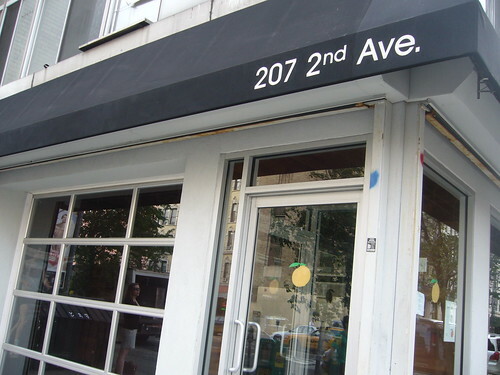 When we got to 2nd Ave and 13th, we didn’t see the restaurant at first. It just had a simple black awning with the tell-tale peach on the door. Momofuku means “lucky peach.” After a quick review over the menu and recommendations, Trix and I ordered the pork buns, the asparagus, banh mi, and pig’s head torchon. Let me just say straight out that though everything was superb, my favorite by far were the buns. 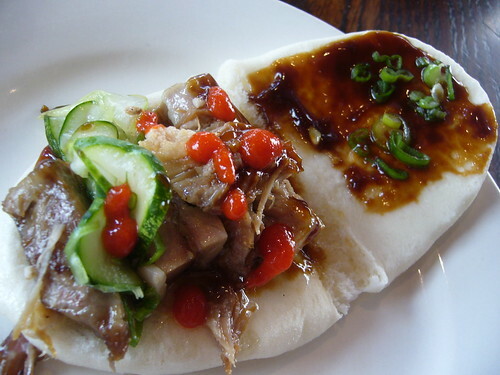 Fatty pork, full of flavor, with refreshing cucumber, hoisin sauce, and a bit of extra kick. Homey, but also, incredibly indulgent, especially when the grease started running down my hands. My only regret was that we didn’t order more. 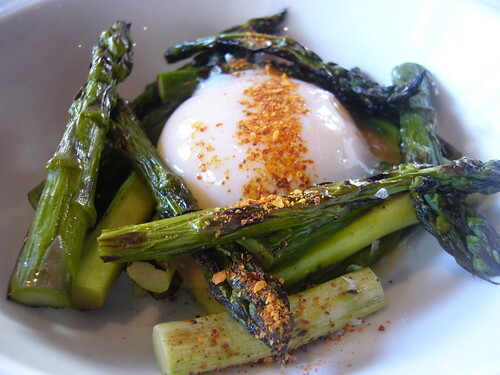 The asparagus encircled a poached egg, wonderfully runny, and perched on top of a smooth and sweet miso butter which I absolutely LOVED. We could’ve just spread it on fresh, toasty bread and I would’ve been happy since I didn’t care much for the asparagus. It really wasn’t anything special and not as crispy as I usually like mine served. 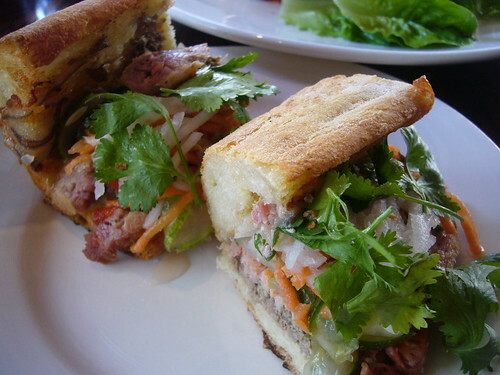 The banh mi was excellent simply because it was my first time trying anything like it. I believe the waiter said there was a top shelf ham with chicken liver pate and veal head terrine along with familiar pickled Asian vegetables. And the crackle of the ciabatta that enveloped all this goodness was a wonder in itself. Ah…if you can’t already tell, I love this restaurant. Our last dish was the Pig’s head torchon which the waiter insisted we try. My god, has there ever been that much fat in so little a space? And FRIED for crying out loud! 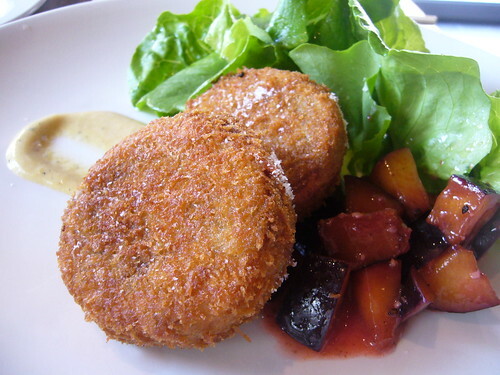 I especially liked how the horseradish-y dressing cut the richness of the torchon, and the way the gingered plums balanced with the saltiness. Needless to say, we left Momofuku feeling very satisfied. Thanks to the waiter who gave us such good recommendations! 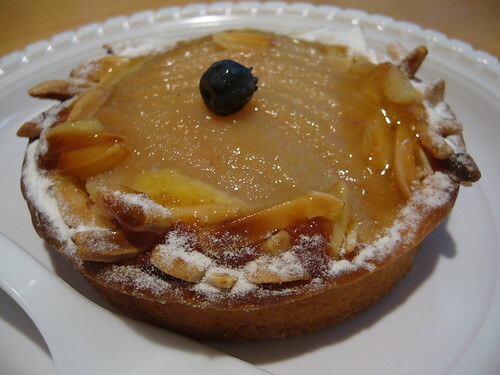 Since we still had some time afterwards, we headed back downtown where I took Trix to Financier. Well, I wasn’t just going to forget the macaron immediately after I fell in love with it right? And this time, there were BIG ONES! I’m a sucker for pistachio (my sister, Laura, isn’t though. When I brought the 8 pack home, I accidentally stuffed it in her mouth in my eagerness to share the love when I suddenly remembered afterwards that she’s allergic to nuts. She didn’t talk to me for the rest of the day. Most likely because she was lying in bed having difficulty breathing. LOVE YOU LAURA!). Trix helped himself to a pear tartelette which earned his approval. All in all, though, after a hectic day at work, it was a wonderful ending to the day. Those buns were made of clouds. Clouds I tell you! Alas, it was getting frustrating because the food all melted in my mouth before I even realized I had put it in there. As if I was courting an elusive lover that vanished into thin air as soon as I touched her. The pig’s head torchon wrapped in lettuce mercifully lasts forever even though it looks tiny. It feels like magical creatures refill your plate when you look away. And that pear tart was bomb! Coincidence! There was an article on the chef behind the Momofuku restaurants in the New Yorker a while back. Kim: We should go to his other restaurant, momofuku noodle bar when we go to the city. It's close to Ssam. Trix: haha, like usual you use metaphors way over my head. the financier definitely has the best cakes and pastries in all of downtown. if you get the chance, try their white chocolate mousse and cassis cake. it is insane. the cassis berries are tangy and sour, but immediately calmed by the sweetness of the white chocolate and almond cake. « Dim Sum Go Go! You are currently reading Trix, Lucky Peach, and The Financier at Notes on Food.